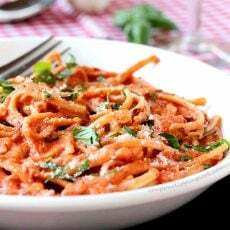 Make this restaurant-style tomato cream sauce and whole grain linguine in the comfort of your very own home in just 30 minutes! Heat a large skillet on low to medium heat and add the butter, olive oil, shallots and garlic. Stir as the mixture cooks for 2 minutes. To the pan, add tomato sauce, salt, dried red pepper flakes, pepper, Parmesan cheese, and half and half. Stir. Turn the heat to low and simmer for 10 minutes, stirring occasionally. While the sauce is simmering, cook the linguine; in a medium-size pot, add water, salt and bring it to a boil. To the boiling water, add the pasta. Stir gently and let cook uncovered until the noodles are al-dente (about 4 to 5 minutes or according to package instructions). Drain the noodles (don't rinse) and add them to the sauce pot. Gently stir until the noodles are coated with the sauce. Top with fresh basil, Parmesan cheese, and dried red pepper flakes (optional). Serve while warm.